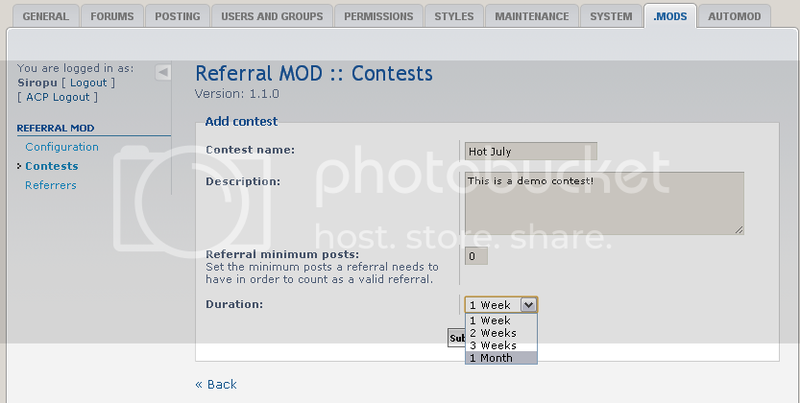 Modification Description: Allows your members to refer others using a personal referral link. You can start referral contests to gain more members. In the contest statistics in ACP you can view all the referrers and the members they referred during that contest. > Display top 5 referrers on board index. > Display user referrals count in viewtopic. > Display user referrals count in profile. > Display referral contests on board index. > Create/edit/delete contest (contest name, contest description, contest duration, contest condition - how many posts a referral needs in order to count as valid). > View contest statistics (how many members have been referred during contest, top referrers - you can view their referrals and how many posts they have). > View referrers and their referrals. > Search for a referrer. > Members can view their referral link and statistics (count of referrals, count of contests won). > Members can view their referrals. > Members can send email invitations. > Make registration by invitation only. > Referrer field in registration form with member search. Last edited by Siropu on Mon Nov 17, 2014 12:15 pm, edited 21 times in total. @Siropu, translation Spanish to Download. Thank you very much, I am looking for this sort of system for our forum to use for rewarding the top referees monthly (which we will do automatically). Can't wait for the planned features, specifically the first one which will be a big plus! Goodluck with the development of this mod, please don't abandon it! I'm pleased to announce the release of version 1.1.0! Everything is in first post. can you add screenshots please? Sure, I've just add them in first post. It's 1.1.0 but I forgot to rename it. Thanks for noticing. I will fix that in version 1.1.1. Also I played with the MOD on test forum and after 20 minutes I still have no an idea what this MOD does. To me it looks like invitations with contest (invite more people than others to win), but how should I use the "Your referral link"? Firstly I thought that I wrote it (referral link) to post to refer the member, but there is not any change in statistics in UCP. Can somebody explain me it, please? I've released version 1.1.1 in which I fixed the UCP friend invite page title issue and the issue with non English characters. Download link in first post. Update instructions: Replace referral_mod_install.php, includes/ucp/ucp_referral.php and includes/acp/acp_referral.php and then run the installer. leschek wrote: Also I played with the MOD on test forum and after 20 minutes I still have no an idea what this MOD does. To me it looks like invitations with contest (invite more people than others to win), but how should I use the "Your referral link"? Firstly I thought that I wrote it (referral link) to post to refer the member, but there is not any change in statistics in UCP. Can somebody explain me it, please? The referral link you see in the UCP can be used to refer others. For example, as a member of your board, I can post my referral link on twitter and if one of my followers access the link and joins the forum, that member will become my referral. As for referral contests, you can start a referral contest to gain more members on your community. In the contest statistics in ACP you will see all the referrers and the members they referred during the contest. Oh, I see. Thank you for explanation.